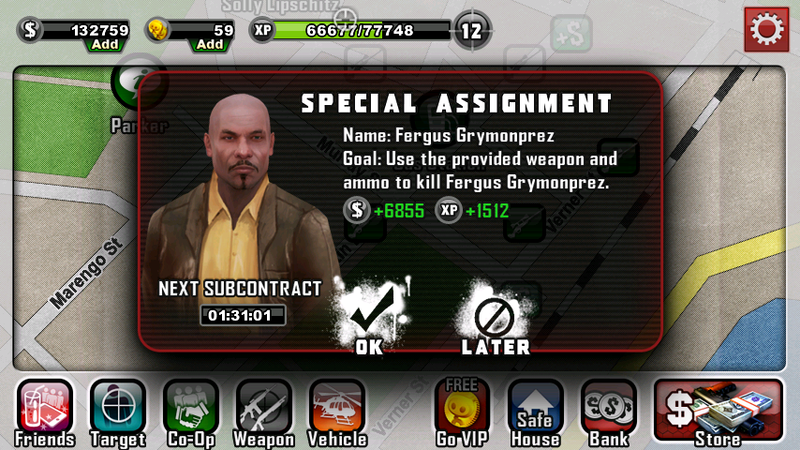 Glu Mobile has done it again with Contract Killer. The app has even topped Angry birds as the most downloaded app for a few days on the iphone. (source:http://www.smashiphone.net/contract-killer-the-most-downloaded-free-game-from-the-app-store/). It's still currently a top App on Google Play. The Contract Killer app lets you play the role of an assassin sniper. The graphics have so much detail it's amazing how fast this game loads and how smooth it runs on my single core smartphone. Even MOVING cars and people walk around in the games simulated environment. Indeed the app was created back when single core phones were still considered powerful, but its graphics and playableness still exceeds most top apps today. Your character develops a social network with professionals like you do in facebook and linkedin, except its with with killers and crime bosses. Loading screens have nice backgrounds and screenshots and a loading status bar. The Background music rock and match a dramatic action movie scene. Helpful Tips are also displayed during loading screens like in Call of Duty Games. However, unlike shooting zombies in Call of Duty Black Ops, headshots really count as headshots when you hit a units head. After you look down the scope, you may even adjust the zoom with the curved gray bar towards the right of the screen. Hit Red Barrels or gas tanks to make them explode. Just make sure you don't harm any civilians. Bullets also go through people so be careful you don't hit innocent bystanders (or people running for their lives). I believe your rewards are improved it you destroy more enemies with less bullets. Med-kits are available in the store. I suggest buying the big packs because you get more bang for your buck. You don't have to snipe or look down the sight all the time. Rifles, rocket launchers, tranquilizers, handguns, and more may also be used once in a while. Unlike other games where you don't get to experience any or many of the available weapons unless you purchase with real money, Contract Killer gives you a different gun on some missions for use on those missions. This teaser method is really cool as you don't have to buy anything to know how it feels to use those weapons for FREE. Purchase silencers and explosive ammo. The menu's and shop are easy to navigate. Easily switch between your primary and secondary weapons with one button (in game) and in the "safe house" which only takes one button from the overview map. The overview map looks like an digital map you would find on googlemaps, yahoo maps or mapquest and are where you make most of your decisions. Icons are placed on the map showing you contacts, job locations, main city locations with a little background information. Contacts have a timer on them until a new contract is available from them. Some shortcut icons are also on a bar towards the bottom of the screen. When starting the app and an advertisment is loading, you can try pressing the back/return button on your android device and it will take you back to the game before the ad even finishes loading. 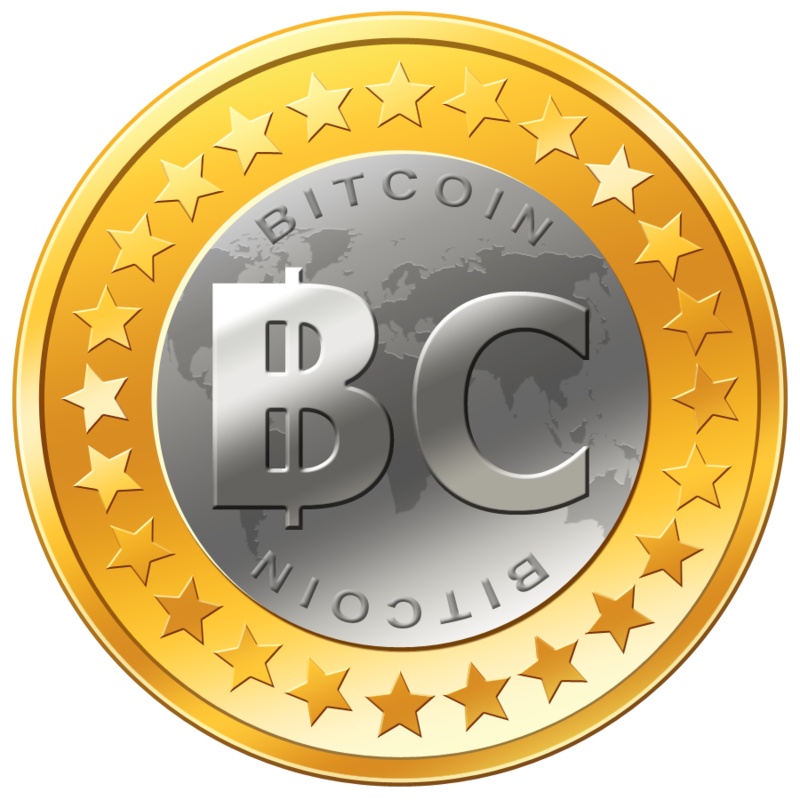 Most if not all contracts have Sub-contracts. Sub-contracts increases your Contracts reward value, but require additional waiting for them to become availble.Vehicle Missions place you on a Moving Vehicle such as a train or Helicopter. Moving missions do not appear on the world map by clicking on a contact like other missions. 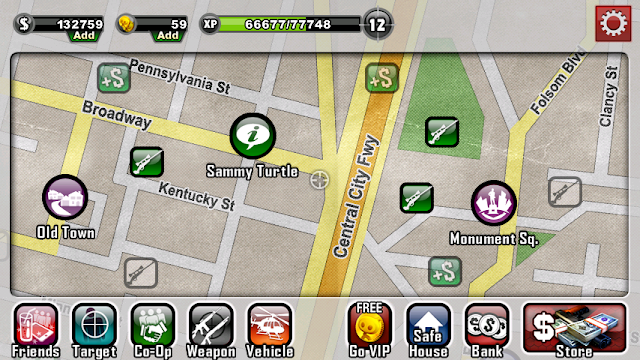 You must click on "Moving Missions" on the map or "Vehicle" in your shortcut bar to access these missions. This missions are actually higher paying and experience giving. Some train missions are a lot more difficult than usual as the enemies weapons hit harder. Weapon Missions require use of other weapons besides a sniper gun. 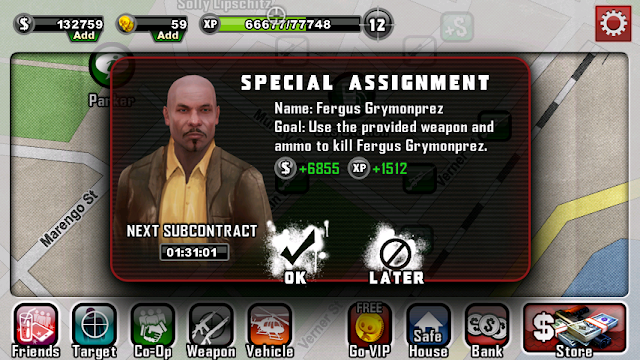 The Contract Killer game is Xperia Play optimized, although this game was not meant to be used with physical controls. Touchpads may be used to aim and shoot, but using the touchscreen allows you more freedom and room for error and adjustments. The hardware controls may also be used to make selections. Again the touchscreen is more useful here. What I found most useful about the hardware controls were to move a reticule around during the short loading screens to keep me busy and feeling interactive and not left out of the game with nothing to do sometimes. 5 Energy (not to be confused with health) is required to take on missions. Every 4 or so minutes you get 1 more energy. You start out with a small energybar, but as you level up your maximum energy increases. On level up you your energy bar is refilled to full. You can refuel your energy bar by purchasing replenish items in the shop using Glu Credits. However I recommend waiting. Once a mission is completed, the contact for that mission will have a waiting period until the contact has another mission for you. Glu Credits may also be used to get rid of the current timer. Again, waiting is recommended. Glu Credits may be slightly earned in game depending on the app, by downloading apps in the advertisements, or buy purchasing with real world money. Unlike other apps, Contract Killer lets you play a long ways and days before you are unable to progress without using money. Notifications can be turned on or off in the settings. When new contracts and your energy bar is full, a notice will be sent to you. Even while expanded, the screenshots look nice and clean. The dialogues and brief mission statements aren't too cheesy and are well written with enough attitude to feel like you aren't just reading "kill him" every time. In fact, you don't kill everyone in every mission, especially the civilians. Yes even killers sometimes have moral codes and standards. You may be required to only take out the boss, or tranquilize him. Bosses dress a little differently than the regular henchmen and have two red pointers on their head (vs one for henchmen) when your crosshair is on them. The fact that Bosses look a lot like the target pictures given to you in their assassination file helps out a lot too. Their clothes and hair style set them apart. I have read before that you should use hunting amo on missions that require only a boss kill because hunting ammo cost less than Sniper bullets. Sometimes, a boss will run away after hearing shots. To prevent this I usually try to get the boss with my opening shot(s). This app gets an AWESOME for presentation. 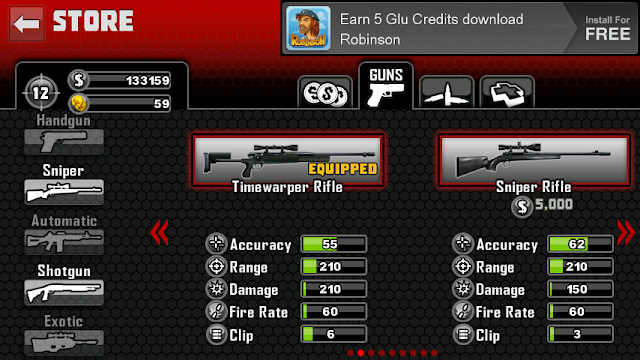 If you're looking for a great sniper app that will last a long time, then Contract Killer is waiting for you. It's possibly the best Sniping app available. I haven't used the facebook features with this app. If you haven't played Big Time Gangsta and toned down Grand Theft Auto games are your thing, then I recommend playing Contract Killer and Big Time Gangsta together simultaneously. While waiting for one of the app's timers to load, play the other (both are by Glu Mobile). This won't work continuously forever, but it definitely keeps you busy much longer.